PURCELLVILLE, CLIFTON, HAMILTON — CarrHomes is putting the finishing touches on three different model homes in three different Fairfax and Loudoun County Communities. All three will be ready for move-in by the end of this year. They can each still be detailed to your taste. And because these stunning new homes will be completed this year, each comes with special incentives for settlement by December 31st. At Waterford Creek in Hamilton, we’re completing a 6762 sq. 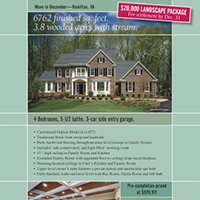 ft. upgraded Oakton model (Lot #27) set on 3.8 richly wooded acres (with a stream). This magnificent 3-car garage home includes a lush $20,000 landscape package for settlement this year. 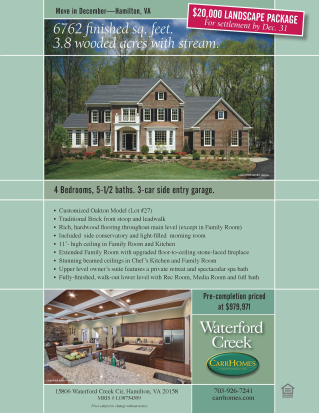 Just up the road in Purcellville, in the heart of Virginia wine country, you’ll also want to see our luxurious, 3-car garage Cypress model (Lot 2A). This 4-bedroom, 4-1/2 bath residence is enhanced by an included rear morning room, an expanded family room with stone-faced fireplace, enlarged owner’s suite and a new (reduced) price of $799,900. Finally, there’s Clifton Point, our brand new Fairfax County community in Clifton, VA., that fits perfectly into the region’s premier equestrian setting. On a beautiful 5-acre site here, you’ll see a grand 7000 sq. ft.+ Augusta model (Lot #3) with 4-bedrooms, 5-1/2 baths, a full, three-story rear expansion and a long list of upgrades included in the price. Think about it. What better, more appreciated, more memorable holiday gift? And with special incentives for year-end settlements, what smarter gift? For more details go to carrhomes.com/delivery/.